SHOULD Trump International in Doonbeg be successful in obtaining planning permission from Clare County Council to build revised coastal projection works on Doughmore beach, next to the resort, the owners will implement a €30 million investment programme. 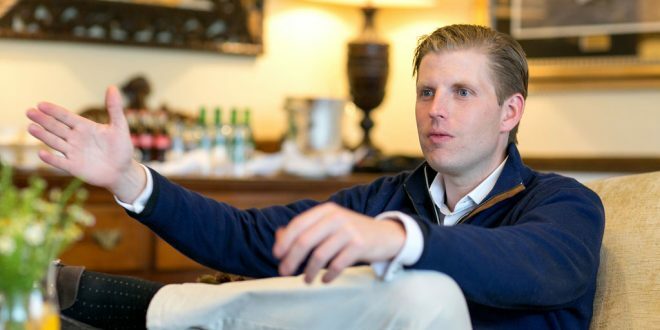 Eric Trump, who runs the Trump organisation with his brother Donald Junior, spoke at length about his plans to The Clare Champion on Tuesday evening. He was on a two-day visit to West Clare. 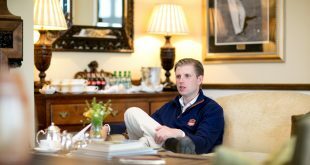 While he offered views on issues ranging from US President Donald Trump’s decision to bomb an air base in Syria to a possible hard post-Brexit border, the 33-year-old was keen to stress his personal commitment to the Doonbeg resort. “It’s tens of millions. Easily €30m, when everything is said and done,” he confirmed when asked about potential investment plans, pending the planning application. “We have a massive plan for an unbelievable ballroom here, which will create hundreds of construction jobs, as well as full-time jobs. We have plans to possibly build more hotel suites. I want to do a massive pool complex here and a fitness complex. We want to do more hospitality, lodgings and villas. We have something amazing here and we want to continue to expand that,” Mr Trump said. However, he added the caveat that it is dependent on a successful planning application. Clare County Council has asked Trump International for further information relating to their latest application, which was submitted last December. “We’re not going to do any of that until this problem is taken care of because we simply can’t. We just don’t know the fate of our property, without being able to protect it. We have put in tens of millions of dollars but phase two and three of the project depend on planning. You’re not going to put up a tonne of money if you’re not certain as to whether or not storms are going to come and wipe three holes off the golf course. You just can’t do it. “I’m confident in the process and I’m confident in the council, which has been fantastic. We’ll get it done and we’ll continue to put a lot of money into this area. I love this area. We’ll end up getting there,” he predicted. On Monday, a public meeting was held in Doonbeg hall, which was called by the recently-formed Doughmore Coastal Protection Group in support of the planning application. Mr Trump was aware of the meeting and said that the support resonates with him. “It means a tremendous amount. They are amazing and hard-working people. They are also sensible. Protective rock was taken off that beach in the 1930s to build roads. Then you have major problems later on. We’re not in the business of building walls but if you don’t build it, you don’t have a hotel. If the hotel is not there, 300 families will be affected. If this hotel is not there, the little pub down the street no longer exists because the guests from here go down there and allow that pub to work. The grocery store, the pharmacy, the gas station and the farmers, whom you are buying produce from, the trickle-down effect is big. “For every one job that we directly have here, there are 10 others that sit behind that. It’s pivotal for an economy on the west coast and I think that’s why 300 people banded together and are fighting for this, with no relation to the club. They understand the impact that losing a hotel like this would have if you had another catastrophic storm come in. If you lose the 18th hole or the 9th hole, where do you put them? There is no more room,” he maintained. Mr Trump does not envisage still talking about this planning application in 12 months time. “I don’t think we will be. I feel pretty good about the process, I really do. I don’t think we’ll be here in 12 months talking about this. Hopefully, we’re working in 12 months. We’ve done every prudent thing imaginable. Every study, every hydrology report, every environmental assessment. We’ve taken this process incredibly seriously and I think we’re going to get a good result,” he maintained, adding that he believes “common sense” will prevail. “I think there is process and then there is regulation. I think we’re going through a process. Without this golf course, which will get washed into the ocean, this property doesn’t exist. This hotel doesn’t exist, which equates to hundreds and hundreds of jobs. I think common sense will prevail. “We’ve had tremendous support. I think we’re going to be in really good shape. The planners around here have been fantastic. We’re going through process,” he reiterated, adding that he has issues with over-regulation. “There is regulation, which is a different thing altogether to process. Everybody would like things to go faster. That’s just the way of life. Do we love waiting? No. Do we feel very confident? Yes, we feel confident. This is such a big part of the local economy. We don’t want to be building that wall because, believe me, it’s an expensive proposition. But we won’t have a resort without coastal protection from the waves, which are getting bigger. Mr Trump spoke of his bemusement at people, who live aboard and have no connection to Ireland, sending submissions to Clare County Council opposing the proposed coastal erosion work application. He cited an instance of one man who lives in Arizona, who sent a submission objecting, to the council. On another note, he is confident that President Trump will visit Ireland and West Clare in his official capacity. “You will see him in Ireland, I almost have no doubt. He loves the country and he loves the people. I think we will see him over here. Our relationship with Ireland, I don’t think will ever be stronger. A €30m inivestment at Trump International Golf Club in Doonbeg hinges on planning permission.